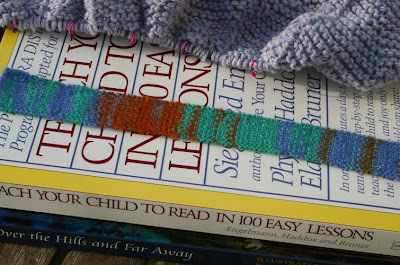 With all the springiness taking place over here and various other crafting and work, the reading and knitting have been scarce in the last week. I'm still working on Elizabeth's cape, and may be for quite a while as it hasn't completely captured my fancy for knitting. And reading for myself these day...I almost guffaw just to think of it. I counted up the time I spend reading to Finn one day last week, and it was over an hour and a half. That's not even counting the time he spends listening to books on CD, which most days is another hour. Tell me how a mama is supposed to find her own reading time with Finn's enormous appetite for books?! I'm not one of those hyper-competitive moms who thinks that her kid should know all the letter names and sounds at age 3 or she's not keeping up with the Joneses. In fact, Elizabeth showed little interest in learning much about letters and their sounds, and she really didn't learn how to read much more than very basic 3 and 4 letter words until 1st grade. I was completely ok with that. She's now a fabulous, engaged reader who picks challenging books and still enjoys listening to me read Anne of Green Gables, and I'm happy with that arrangement. Philip was similar although the reading came even more easily to him when it happened, and at the end of first grade he was blazing through Harry Potter books until we made him stop because the content was too advanced for his age. Needless to say, I was not overly concerned with teaching Finn to read at age 4. Until he started trying to teach himself, that is. He would bring books to me with a word under the picture and ask if that word said "witch" or "truck" or "I'M NOT TIRED" (yes, he reads pigeon books), and he usually was right. He could recognize the word "car" anywhere and would stop me when reading to ask me to point at the word I'd just read so he could see it. Clearly, the boy wanted to read. On the advice of a few friends who had good success with it, we bought Teach Your Child To Read In 100 Easy Lessons. We're only on Lesson 13 and not pushing them any too fast, but he must ask me 3-4x each day whether we can do another work in his "m, s, a" book (what he calls the book since the first 3 sounds he learned were m, s and a...so cute!) I only let him do one lesson each day, but I do review with him if he really wants to work on it more. Today he read 8 words, and his first sentence. The look on his face beaming with pride told me that this is the right thing for him right now. Wow, sorry I prattled on about that longer than I intended. This is supposed to be a Yarn Along! I'm also reading Over the Hills and Far Away to whichever kid will listen at any given time. I love all the stories of dwarves, elves, gnomes and fairies, and Daniela Drescher's illustrations are second to none in my book. 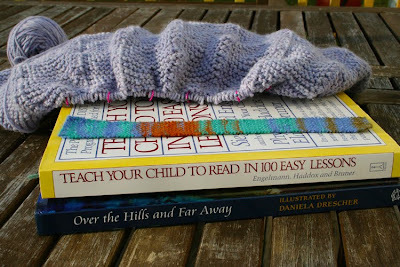 Lastly, the wee little strip of knitting is a bookmark I made for Paul's recent birthday. 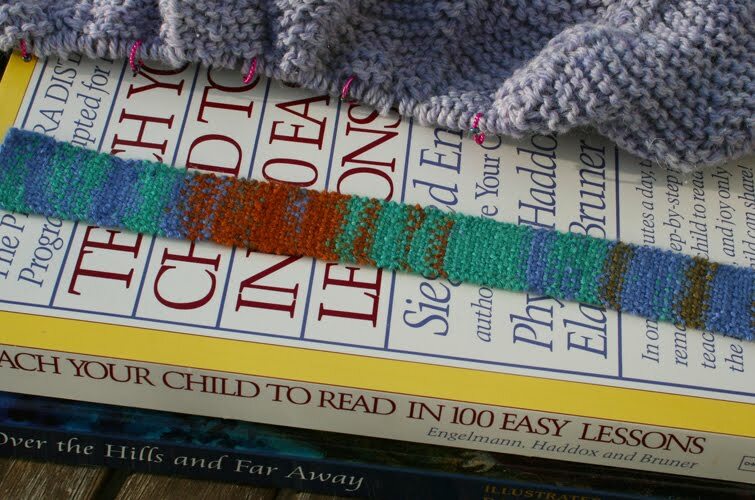 From More Last Minute Knitted Gifts, it truly is a great last minute gift and I really liked how the pattern made the bookmark look more woven than knitted. Are you reading or knitting something interesting right now? Please share! One of my favorite books in teaching a child to read! That is wonderful about all your little readers :). My son is a slow going reader, he is just now beginning to take off at 8 years old and I am so happy for him! Thanks for the book rec., my 6 year old is beginning to show signs of readiness!! I've seen that book and wondered how it was. I love watching these little people dive into reading. It is such an exciting time. Thanks for the reminder on that bookmark - just the thing for an upcoming birthday! Yours looks lovely! Thanks for recommending the lessons for reading book. I'm with you--in that I don't want to push kids to do what they're not ready for--but my four year old is really trying to figure out how to read, and this may be a good way to support her. Isn't it amazing and wonderful how different each child is? I really like how the bookmark came out. My Monkey probably won't be reading for a while yet, but thanks for the recommendation. I'll keep the book in mind for the future. How wonderful that you can go with each child's natural flow. 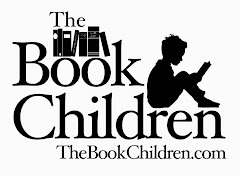 We have had early reader, late readers and some right on time (what ever that means) We've use both Teach Your Child to Read in 100 Easy Lessons as well as The Ordinary Parent's Guide to Reading. Both really great in my humble opinion. Over the Hills and Far Aways sounds delightful. Will have to see if our Library can get it. It's so exciting when they begin to grasp those first sentances. We're still not quite there with our five year old yet, but she absolutly loves story books which is lovely. THe knittig is coming along beautifully!